Has America Already Hit “Peak Car”? In 1901, there were 10,000 motor vehicles in the United States. It took five years to multiply that number by 10. The next 10-fold increase took seven years, reaching one million vehicles by 1913. Just eight years later, it was 10 million. From there, it took 47 years to get to the next milestone: America became a 100 million-car nation in 1968. Automobiles were everywhere. It stands to reason that the number of cars in America eventually crept upward at a much slower pace – and then started to decline. The total number of light duty vehicles in the United States topped out in 2008 at 236.4 million, according to a recent analysis of FHWA and Census numbers by Michael Sivak, the director of the Sustainable Worldwide Transportation program at the University of Michigan’s Transportation Research Institute. In his report, “Has Motorization in the U.S. Peaked?” [PDF], Sivak concludes that the dip in total vehicles coincides with the economic downturn and will probably rise again with population. But significantly, Sivak found that the ratio of cars to people is dropping – and will likely continue to drop. Since these rates started to decline before the recession, Sivak concludes that there are other explanations for the decline. “These rates started to decline not because of economic changes but because of other societal changes that influence the need for vehicles,” Sivak wrote. “Thus, in contrast to the absolute numbers, the recent maxima in the rates have a better chance of being long-term peaks as well. 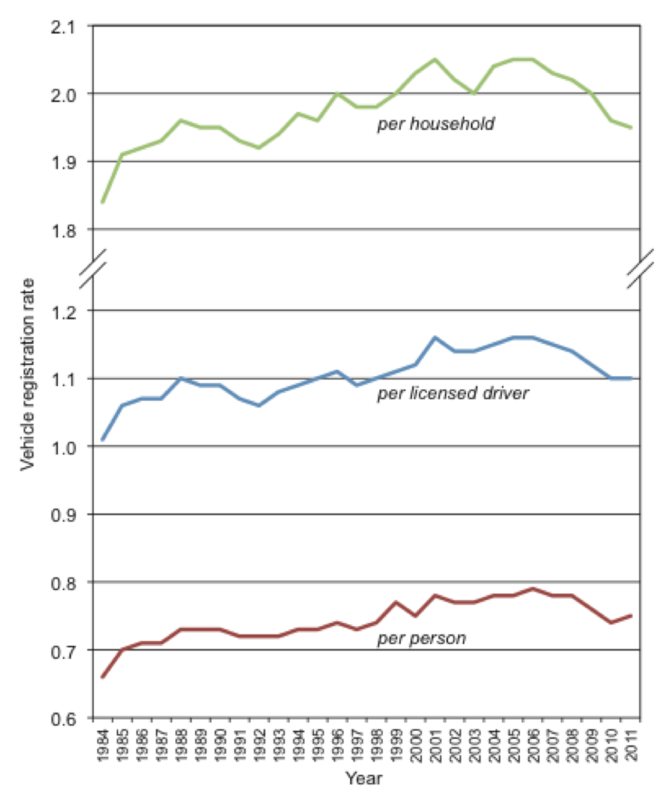 Vehicle ratios per person, per licensed driver, and per household all peaked between 2001 and 2006. There were 0.79 vehicles per person in 2006 and 0.75 in 2011, the most recent year for which data are available. Vehicles per licensed driver hit 1.16 in 2001, 2005, and 2006 but is now back down to 1.10. And in 2011, the number of vehicles per household was at its lowest point since 1993 – 1.95 vehicles per household, after being above 2.0 for 11 years. Maybe it’s because about one-third more people are telecommuting than in 2000, Sivak speculates, or because the share of Americans commuting by transit has risen from 4.7 percent to 5.0 percent. The decline in driving has been measured in countless ways – reduced vehicles miles driven, teens getting drivers licenses later, changing priorities about where to live and how to travel. The decline in household and personal car ownership rates is another lens through which to view our rapidly changing societal trend toward more sustainable transportation and more livable communities. No wonder Ford is worried. US oil consumption per capita has also been declining since 2004 (we are now back to pre-1965 per capita oil consumption levels), and total US energy consumption (from all sources) per capita has been declining dramatically since 2000 (we are now back at 1966 per capita energy consumption levels). US VMT per capita has been declining since 2004 and we are now back at 1995 levels. Even US electricity generation per capita has been declining and we are now back to 1998 levels. The forces currently in play will extend these trends, not reverse them. The only factor pushing car ownership right now is the explosion in subprime auto financing courtesy of the Federal Reserve. Please add a trend line for GDP per capita or the S&P to reflect the effect of recessions. Otherwise I can’t see the difference. GDP per capita and S&P 500 don’t mean anything. Wages have stagnated for 99% of the population for about 35 years now. GDP per capita has risen a LOT in the last 30 years, but ALL of that growth has gone to making the rich richer. You’re right, those metrics are imperfect. I’m adding the employment-population ratio over the same period. I would add shifting demographic tastes as well (young people prefer to drive less). But that’s a guess. One issue is that driving peaked at least a year before the recession, and it was around 2 years after the Jun 2005 before MOST people felt anything. The graph, from Jun 2005 to Jun 2007 is pretty much flat. Definitely not enough of a downward slope to affect driving habits. From everything I’ve been able to research, the reduction in driving, if anything, helped cause the recession. The reduction in driving is in large part due to a societal shift. Young people do not have any desire to spend 10-20% of their waking lives sitting in traffic in a little metal box burning money. Suburban and especially exurban (McMansion) housing is NOT attractive to younger people. As such, a large chunk of the home buying population 25-35yo, people getting their first home, are either continuing to rent or buying in pre WWII areas. Even a drop of 10% in demand for exurban McMansions would cause their stupidly inflated price to tumble, causing the housing market to crash and the banks to fail as people default on homes that no one wants. The reduction in driving definitely precedes the recession and quite possibly caused it. That’s an interesting theory with which I tend to agree. Driving (and traffic levels) peaked a few years before the recession. That may have been enough for a large part of the population to no longer see the car as a ticket to freedom, but rather as a black hole for time and money. Even people who drove for years may have finally reached their breaking point sitting in traffic day in and day out. Suddenly that big house out in the exurbs was no longer attractive when all you did was sleep in it during the work week (and often on weekends too because you were too exhausted from driving all week to enjoy it much). People made the decision to trade time for less square feet of living space. And as we know, the rest is history. I think we might be on the verge of another tumble as even closer in suburbs suddenly become less desirable thanks to ridiculously high traffic levels which still exist around large metropolitan areas. For example, look for everything east of Nassau County to take a big tumble in the next few years, perhaps following by the eastern half of Nassau. Between 2005 and 2008 gas prices want from $2 to $3 a gallon, when driving started to decline. It took a plunge with the 2008 crash. Weak economy. Increased inequality. Increased congestion. Aging demographic. Younger people and immigrants clustering in cities. As long as these hold, people will drive less. If things reverse, I fully expect more driving, simply because our policies and infrastructure are so devoted to promoting vehicular traffic. One thing is certain-gas prices aren’t going down to their 2005 levels, ever. I think we’ll see $7 a gallon gas once the world economy is completely out of this recession. The only way I see driving increasing in that environment is if most of the vehicles are EVs. Eventually I’m sure this will happen, but for now most people can’t afford to replace their car unless it’s broken. That means less driving in the short term for sure. If most vehicles are EVs – expect the price of electricity to skyrocket. Only if we have to add more peak capacity. Peak capacity is what costs electricity producers heavily. It’s debatable that we’ll need more generating capacity at all. Between using less electricity for lighting thanks to LEDs, plus solar panels becoming mainstream, we might be OK. The latter is especially relevant. I suspect if electricity prices start to go up, many EV owners will install solar panels to charge their cars. Don’t forget we’re not going from a few thousand EVs to millions overnight. The grid will have time to adapt. Whatever the reason for the decline, people learn new ways of doing things. We wouldn’t be the first generation to gain new habits in times of economic hardship that we keep when good times return. Big trends are started by small groups of influential young people. In New York City in particular, and in many other metro areas around the country (DC, Chicago, and others) growing segments of young people flocking to urban life are doing so without a car.Using a bike or transit is not a loser thing, it’s a cool thing. What would be an interesting trend line to add is “Miles driven.” This would speak to some of the trends toward “urbanization” (i.e., reversal of suburban sprawling) for a segment of the population. I think these numbers alone say a lot about the “family” unit — i.e., no need for a family of 4 to have 3 cars, etc. However, it still leaves that gap concerning use. I wonder how much of this is happening… folks owning cars, but not using them as much and more for “special” reasons — weekend trips, big grocery shopping, etc. This type of usage would also make *buying* a car with one of these long 72-month mortgages more attractive than leasing because folks won’t be “wearing out” their car and keeping it for 10+ years makes sense. One question to follow will be the extent to which people who were “driven” to transit (pun intended) by a weak economy will stick with transit in better times. Vehicle Miles Traveled (VMT) per US population over 16 years of age has dropped significantly since 2005. EVs are horrible expensive. If more people start buying them, lithium and other rare-earth elements needed to make them will go up in price, from more demand. Used EVs will also be horribly expensive, as a 12yo EV will need a new battery. So instead of buying a Honda Civic that’s 12 years old for maybe $5,000 like one can do today, it’ll be $5,000 + price of a new battery, which right now is something like $10,000. Even if that price goes down some, entry-level used cars will go from the $5,000 or so low-end price (for anything not a complete junker) to about $12,000+. New car prices on EVs are already outside the finances of most Americans, and used isn’t much better. I don’t see EVs replacing autos anytime soon, if ever. 2-4 person electric surreys and velomobiles, maybe. Full-blown, 4,000+ lb EVs, not so much. For every child not driving a car, there’s an adult that can’t think outside the ‘box’ enough to realize there’s ways of getting a child from place to place that doesn’t involve a 4,000lb machine. I know a few people personally who traded their bike for a car when they started having kids. So I don’t think these graphs are overly skewed by some sort of boom in children, as such a boom would both increase the obviously non-driving children, but also pressure more adults into driving. I should point out that there’s research underway to make EV batteries which use carbon instead of lithium. And there’s also research into rare-Earth substitutes for the motor magnets. Worst case you can make EV motors without permanent magnets. They’ll just be larger and heavier for any given horsepower than rare-Earth magnet motors, but it can be done. Even right now, if EVs were mass-produced in similar numbers as gasoline cars they would actually be less expensive because they’re far less complex. Think of all the close tolerances going into machining an engine or a transmission, for example. I can’t speak to how much used EVs would cost, or whether they would need a new battery. Ongoing research into ultracapacitors instead of chemical batteries would render that moot. Ultracaps last hundreds of thousands to millions of cycles. Or put another way, if used in EVs the battery would probably be the only part still working after the rest of the car was worn out. I personally think our future is fewer 4,000 pound vehicles, period, regardless of how they’re powered. You make a great point about electric powered velomobiles. The same 750 watt motor which at best powers an e-bike to about 30 mph could power a velomobile at more than twice that speed. A battery pack weighing 10 pounds could give a range of over 50 miles. Wow. Thanks for this Karen Lynn Allen! It’s nice that they included recession markers — It shows that economic downturns have an effect, but the current trend started a few years earlier (just like the data above suggested). one of my cars from a few years ago was like that. 23000 miles after 5 years of ownership. lots of people in NYC have cars they only use on weekends and park them on the street or garage the rest of the week. I’m similar to Tyler in that I am a car owner and occasional driver, but I make far more trips by bicycle, foot, or transit than by car. I think I average around 100 miles/month on the car. Based on my own experience and people I know, it seems like a lot of nyc car owners are occasional drivers as opposed to regular commuters. I could easily get rid of my car and use zipcar or a similar service, and if on-street parking became costly I would probably do so. There are certain areas of the city that are more suburban and do not have good transit options, there are people who need a vehicle for business (tradesmen and contractors), and for most other people I think it is more of a luxury. Yes, but my reading of Karen’s very useful graph is that recessions are the only real cause for steep drops in driving. After every one, there has been an increase in driving. Let’s see if this last recession, the most severe since the Great Depression, will have jolted us into a new reality. In theory we’ve been out of recession for the past three years but VMT has still dropped. People are still shell-shocked from the recession, and looking for ways to save money. Many are finding that driving less is one big way to do exactly that. I suspect after doing this for a few years, it’s actually becoming an ingrained habit which will survive the recession. If anything, not using motor vehicles as much has made people realize they’re not as essential as once thought. I am all for more transit use and biking/walking, but I’d prefer that it not be because people can’t afford cars anymore. Demographics important? Yep. Driving habits of young people important? Yep. Median wages down 8% since 2000? Yep, that probably matters too. The problem is whether there’s a gap in tech or not. Sure, ultracaps and carbon batteries MAY be on the way, but if there’s a gap of even 10 years in tech, our transportation network will have to dramatically shift away from POVs and more toward bikes and transit. If cheap EVs aren’t available in about 5-10 years, we’ll start pumping money and manpower into transforming cities to being people-friendly again and focus on transport. EVs won’t have a ton of focus, since we’ll need to focus on proven tech. Personally, I don’t see EVs being anything approaching reasonable before gas prices push at least 75% of the population out of their cars, and at that point, that 75% majority won’t allow the other 25% on the road anyway, since the only reason peds/bikes have to share the road with cars is due to motorists having a majority. Once that’s taken away, I don’t see the middle-class majority allowing themselves and their kids to be run down in the street by the remaining few rich who can afford to drive; they’ll ban POVs once enough majority is reached. If there’s a gap of 10 or 20 years between gas cars being ‘affordable’ and EVs being the same, we’ll shift away from cars altogether and I don’t see why we’d make the same mistake twice and go back to them once we’ve put in massive transit networks and human-scale cities. The youth don’t want to drive. Yes, it’s in large part due to price, as youth don’t have $10,000 a year to waste getting fat in a car. It’s also, mostly, due to preference and technology. It’s not just the price of gas. Not only is transit cheaper, but it takes less time. 25 minutes driving is 25 minute out of one’s day. 45 minutes on transit is 45 minutes of relaxation, facebook and internet, which would have been spent that way anyway, just relaxing at home rather than on transit. That’s an interesting point of view. A lot of people assume that as soon as gas prices rise enough to start making gas cars too expensive for the masses EVs will be ready to fill the gap. If they’re not, then obviously you’re right-people will just stop driving and we’ll start redesigning our cities with more public transit. In any case, we both agree that gasoline-powered cars have no future either way. Despite wishful thinking by some people, I’m not seeing gas prices going anywhere but way up. And yes, in the event there is a gap between affordable EVs and gas cars, I’m not seeing that we’ll be going back to automobiles in our cities once we’ve redesigned them for walking, biking, and transit. We’ll still have autos in suburban and rural areas, but because the majority in cities won’t drive, we’ll have the political power to prohibit personal cars on our streets. I personally feel electric power will be viable for large vehicles like city buses in the relatively near future. A city without private autos where all the emergency, delivery, and transit vehicles are EVs would be a much nicer place to live. Charlie in Sonoma County, Cal. I still see home driveways choked with multiple vehicles. I doubt that our fascination with automobiles will ever end. Electric cars will be quite popular in the upper-class market. But they will not replace the current mass-market use of cars. So, less driving. There is strong evidence that the rise in mobile devices is also part of the cause of less driving. You cannot use your Kindle or your iPhone while driving. oil demand, vehicle kms traveled, the size of the car fleet and car sales. The drop in electric demand due to LED lighting (and to a lesser extent CFL lighting) is actually extremely substantial. As far as I can tell, within the US, it’s completely cancelled out the increases in demand due to more population etc. It’s worth noting that solar panels show up in the stats as “reduced demand” (for grid electricity) too. And there’s also insulation improvements, for those who heat or air-condition using electricity. Anyway, there doesn’t seem to be an increase in grid demand. This leaves us with a lot of slack to add things like electric cars. One warning about reading the numbers. The electricity generation numbers are generally “utility scale” generation only. Home solar panels show up in most statistics as reduced consumption, not as increased production.